Dolphins are not only highly intelligent, but also kind and welcoming. 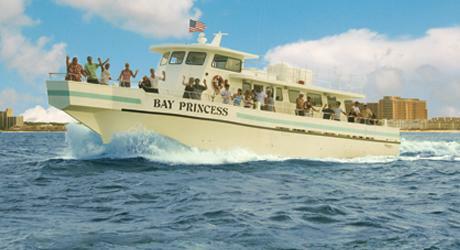 That’s why dolphin cruises, like the ones we offer at Dockside, have become so popular. Dolphins just love to have fun, and that’s due in large part to their behavior. They often travel in packs of at least two or more, for protection against predators and social interaction. When a dolphin is injured or attacked, the group will help take care of them by bringing them up to the surface to breathe. If there’s food around, the groups tend to be bigger. A dolphin doesn’t stay in the same group forever, and will likely switch for food-related or migratory reasons. That’s when you’ll hear the whistling or vocalization that many people associate with dolphins—it simply means they’re excited and happy. As a result, they’ll often chase each other, or brush up alongside one another, for physical contact. It’s how they interact with their friends! They play with humans just like they’d play with other dolphins, and take to humans like friends. Over time, dolphins can grow very loyal to their caretakers, creating a lifelong friendship that is rare with other sea creatures. But from what we know of their behavior now, that’s no surprise. Getting to know a dolphin is an experience like no other. 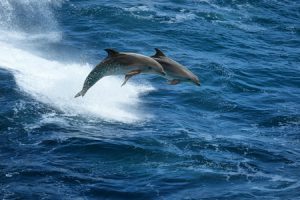 At Dockside Seafood and Fishing Center, we offer dolphin cruises that allow visitors to see these incredible creatures in their natural habitat and enjoy their presence. Make a new friend today by calling us at 757-481-4545!